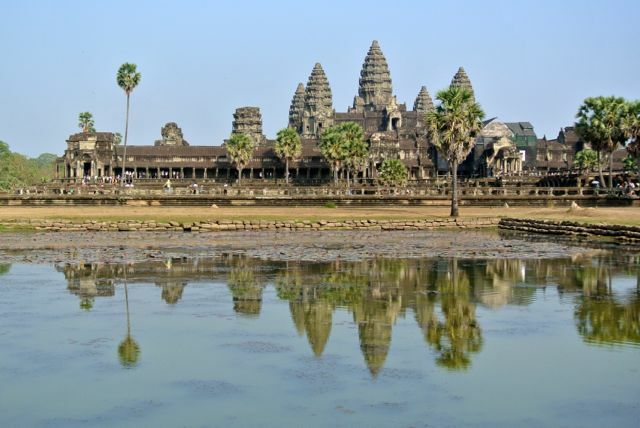 A journey to Angkor begins with mixed emotions: Reading about Cambodia and its history means learning about a history of war, civil war and atrocities – as recently as 1998. Talking to people about Angkor Wat means rising expectations with every word.I arrive in Siem Reap by boat from Phnom Penh and the first impression is off the floating village on Tonle Sap lake. It looks serene, until you set foot ashore to be welcomed by the local tourist entrepreneurs. The ride on the back of a motorcycle to the sleepy town amid lush, green forest is a fun start to my adventure! Yet another contrast is apparent on the ride from the chaotic town to the World Heritage Site: The modern, efficient park management hands out a laminated pass with my photo after a minute and I’m back on the road through the forest towards the temple. The main temple of Angkor Wat is an image in my mind that I will never forget. The complex is surrounded by a huge moat that lets its European counterparts appear like a miniature. A wide causeway leads towards the wall enclosure and the main gateway. I proceed across the long causeway, every step with increasing suspense. I am walking up to the portal with its doorways and towers, climbing up the stairs and through the dark gate. 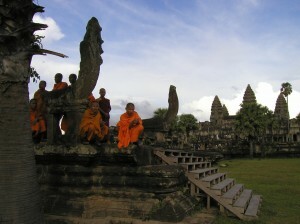 The step into the light allows the first glance of Angkor Wat, a view like few others. The main temple sits across a large courtyard, at the end of a wide, elevated causeway, its stupas rising towards the sun. Ponds and library buildings complete the scene. As I go on in awe, the image of three towers gains depth and dimension, and I see that there are eight towers grouped around the central stupa, every step revealing more detail of this complex. I spent the next few hours climbing through and over the temple, the many details enriching the great first impression. Smaller buildings walls, different angles and light, steep staircases and dark hallways, murals and carvings make for a never-ending tour. I climb one of the smaller side buildings and rest in solitude, absorbing and enjoying the moment. 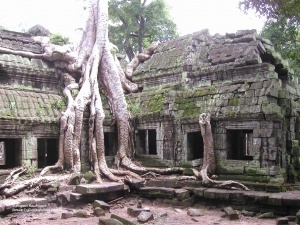 I see many more temples of Angkor and learn about the complex city design. It had a brilliant infrastructure, including complex water management, and was the heart of a city of 100,000 people at a time when London had less than 30,000. I spent three days in Angkor and explored many of the other amazing temples, like the jungle temple, Ta Phrom, you might have seen in the Lara Croft movie, or the much smaller, beautifully decorated Banteay Srei. And I even wander around the temple city of Angkor Thom, yet I return every day to Angkor Wat to walk through the gate and experience that first glance at the temple, again and again. And it remains as captivating on my last visit as it was on my first. I have since returned multiple times to Angkor Wat, yet I’m still as amazed as the first time whenever I visit!